Anas Platyrhynchos mating on the roof at two in the morning – The Diesel-Electric Elephant Company. I took a little gander the other day, a strollette if you will, just to see what is coming up in the way of canal for the Cardinal to enjoy at our next removement. Walking south from Hack Green locks towards Audlem – but, having failed to fully recharge the batteries in my hip-replacements, my legs turned me around at Overwater Marina. It’s a bit picturesque, although the towpath is a hippopotamus’s mud-wallow dream in places. My turn-around point was just beyond the bridge in this photo, I went as far as the Overwater entrance, saluted the flag and volte faced. 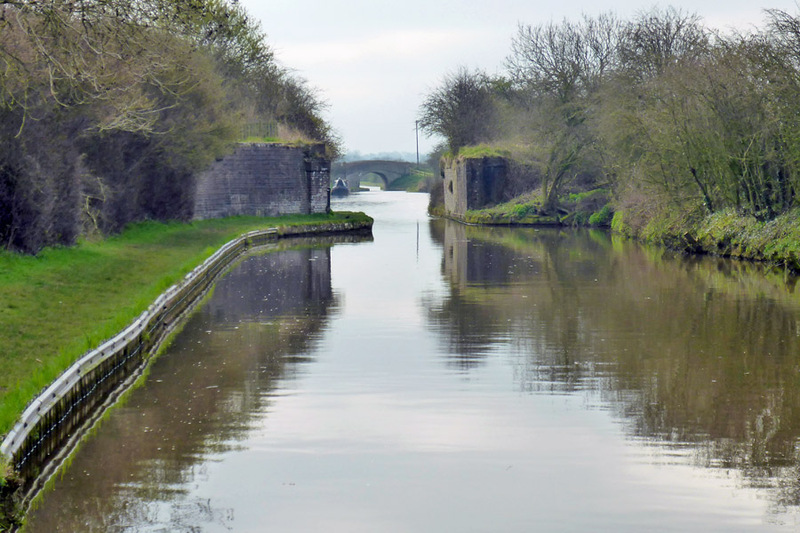 There are no locks a-rising, but there are some nice bridges, some nice places where bridges used to be, and a hefty complement of what I now learn – having struck (pardon the word “struck”) upon the correct form of “google search terms” – is the “Shroppie Shelf”. The underwater obstruction that had me floundering in no uncertain terms on the way down from Barbridge to Hack Green. Apparently it is both well known and extensive. Whodathunk it? …and only really an operational obstruction should there be bi-directional simultaneous water-borne vehicular traffic of an unfortunate nature. Otherwise, plenty of room. The more genuine “Shroppie Shelf” (spits into the wind and curses its existence) is more difficult to spot – especially if one is so cabbage-green as to know nothing about it, and one is already battling a Force 16 cross-wind, indigestion and a flat-cap that won’t stay on without the use of six-inch nails. There’s an intriguing section mid-way, reminiscent of the claustrophobia of the bunker room, where the canal runs through a sheltering cutting and the very substantial remains of what I assume to be a removed bridge. Still, as Benny Hill once said of the milkman’s early-morning rounds with his horse, the benefits of persistence are manifold. Benefits manifold with or without a loaf of Slimcea and six Ski yoghurts in little plastic milk-churn shaped pots. The rural idyll. Although we’re not too far from Wales, this place isn’t called “Idyll”. The sun joined me on my perambulations, eventually. I like the sun joining me, for then I know that my solar panels are feeding. Feed, my little ones, feed on that star and lay fat and substance all about my battery-bank. Feed. This being England, of course, I was monitored from the air at all times by the authorities. …and subject to frequent goosing. Overwater – this is the very first marina entrance that I guided a narrowboat through, many moons ago. It too has a dose of “Shroppie Shelf”, right opposite and oblige. I did notice one thing about Overwater. It suddenly struck me as I walked and gawped. Shiny boat, shiny boat, shiny boat, shiny boat… and you get the picture. Hundreds of them. All shiny. I wonder if, before mooring, boats are made to stand under some shine-equivalent of the “you must be this tall to ride” signs in fairgrounds? Just a thought. Anyway, the important thing was scoped out – service pontoons to the left of the entrance. I intend, soon, to deprive them of a quantity of potable water and to leave them a little something less agreeable in return. The perambulations did the trick in re making me wish for my pit, and I almost slept well that night. Almost, but not quite. There is something quite magical about being awoken at two in the morning and having to dress and go outside in the cool and the darkness – to eject mating ducks from the boat’s roof. Common or garden Mallards, Anas Platyrhynchos no less, and shameless with it. The disturbance was not so much the very distinctive (“oh god, oh god, oh god”) sound of duck-orgasms as it was the subsequent fighting and stomping around. Even once deposited in the water with my uber-bright torch beamed upon them they gave me that sort of duck stare, the one that says “Yeah? And what are you going to do about it, Mr Paisley-pattern pyjamas?”. In future I shall leave the blunderbuss loaded. No photographs of course. Well, what do you expect at two in the morning in the middle of nowhere? Some sort of Lord Lichfield portrait performance? I did well to find my spectacles at that hour. I also make no comment on the morals of ducks, except to note that there were three of them going at it on the roof. That submerged Shroppie Shelf looks inviting Ian, but I hope you give it a complete miss, or you’ll have a mess. One is apt to forget how wild it is out there in rural climes. How shocking to learn such things – do people still wear paisley pajamas? It’s enough to put even the Mallards off their stroke! Surely there’s a country dress code? A cravat and a smoking jacket would suffice to take the eye away from such frivolities? At least it was dark and I expect the torch light didn’t penetrate too far! Pure poetic licence, at night I wear only my leopard-skin onesie, deely-boppers and eye-shades. They help me sleep the sleep of the innocent*.